When I teach people how to make sauerkraut, I encourage them to treat cabbage as a base for other vegetables, fruits, herbs, and spices. Cabbage is a great starting point for fermentation, and by adding some of the same ingredient combinations you love in salads and other dishes, you can create all kinds of amazing variations on classic kraut. Case in point: apple-fennel sauerkraut, inspired by a shaved fennel and apple salad that I adore. This approach also gives you one more outlet for preserving produce when it’s at its seasonal peak, a great way to eat as locally as possible in leaner months and support nearby growers. And of course, fall is peak apple season in New York—so now is the perfect time to preserve apples any way you can. For this recipe, choose an apple variety that is firm and a bit tart. Two of my favorites are ‘Mutsu’ (also known as ‘Crispin’) and ‘Stayman Winesap’. ‘Mutsu’ apples can grow to be huge, so you may only need one for the recipe below. If you don’t like fennel, by all means substitute an herb or spice that you do like—mustard seeds or caraway, perhaps. Be creative and you’ll come up with something that’s perfect for you. This kraut is delicious paired with sausage or roast pork or added to potato salad, stuffing, or chicken salad. Try it with anything that could use a nice tart kick. Remove any dark outer leaves from the cabbage head and cut it into quarters. Remove the core and slice each wedge into strips 1/4-inch wide. Mix the cabbage, apples, salt, and fennel seed together in a large bowl, massaging the cabbage to help the salt penetrate. Put the cabbage mixture in a tall nonreactive container like a glass jar or plastic pitcher and press down on the mixture until it releases enough liquid to cover itself. Place a weight on top of the cabbage (a doubled-up plastic zip-lock bag filled with water or a jar of water placed on top of a plate work well). Any material that is not submerged in the liquid will rot. If the cabbage is not readily releasing enough liquid, add more weight and check back within 24 hours to make sure the mixture is covered with brine. If it’s not, add a heavier weight. Cover the top of the container with a towel or a loose lid. Do not seal tightly—your kraut needs to breathe! Put the container on a plate to catch any expelled juices and store at room temperature to ferment for one week. At week’s end, remove the lid and weight to check your kraut. Remove and discard any rotten spots that may have developed at the surface. The cabbage below these spots is totally fine. 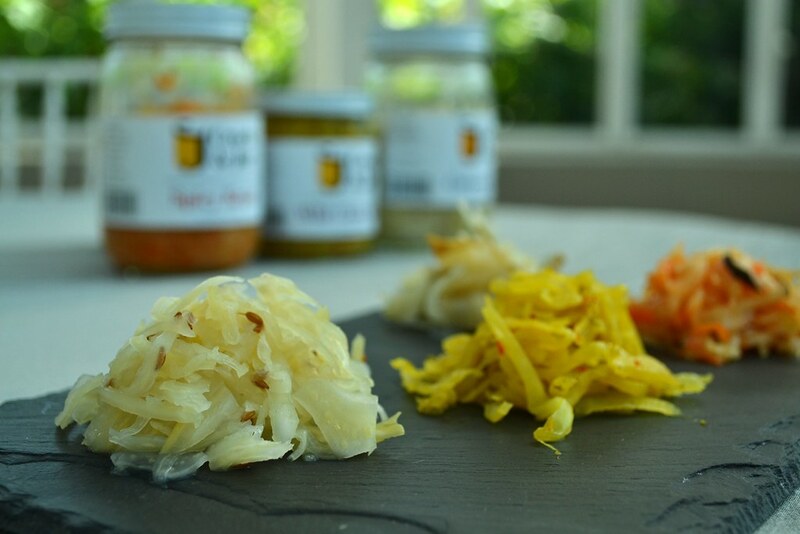 Taste your sauerkraut to check its progress. Press the cabbage down again to submerge. Clean any mold off the weight and replace it on the cabbage mix. Cover the container again with a clean towel or loose lid. Check the sauerkraut once a week. Depending on your preference for sourness and texture, the cabbage will take three to six weeks to ferment fully. Once it is to your liking, remove the weight, tighten the lid, and store it in the refrigerator for up to six months. Michaela Hayes will be teaching Preserving Fall Veggies at BBG beginning November 2 and The Tropical Kitchen in Winter in December. Classic sauerkraut is a great starting point for preserving cabbage. Other fruits and vegetables can be included too. Photo by Blanca Begert.